I wasn’t able to make up my mind on what to have for breakfast, maybe I wasn’t hungry, but I had to eat otherwise, I won’t be able to concentrate on my work. I thought, why not make Cream Cheese Jam Stuffed French Toast, and take some clicks too. Oh, the life of a food blogger! I don’t just think if I would like this breakfast, I have to also see if it will look good enough to become a post. At times, I feel that my blog is about to take over my life. I’m constantly thinking about new recipes and food styling. Talking about food styling. There are days when I make a good-looking dish, but my brain acts stubborn and does not help me style my food. In the beginning, I used to struggle with my brain, try to convince it how important it is to help me make my dish look good (Yeah, I talk to my brain sometimes!). Why am I ranting? I should tell you about the French toast right. Sorry, that was on my chest and now I feel better. Back to the Cream Cheese Jam Stuffed French toast. 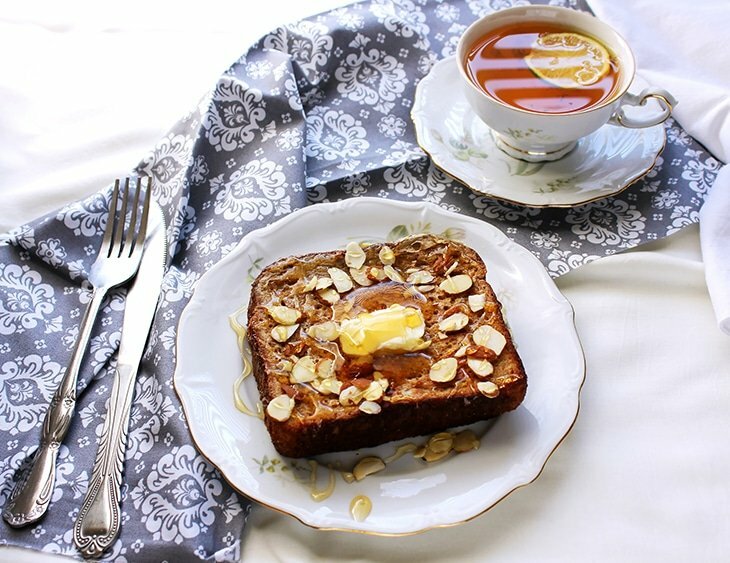 This breakfast had everything I like, the custard gave this French toast the right fluffy, light, yet rich texture, the combination of nutmeg, cinnamon, and vanilla gave it a great balanced flavor. 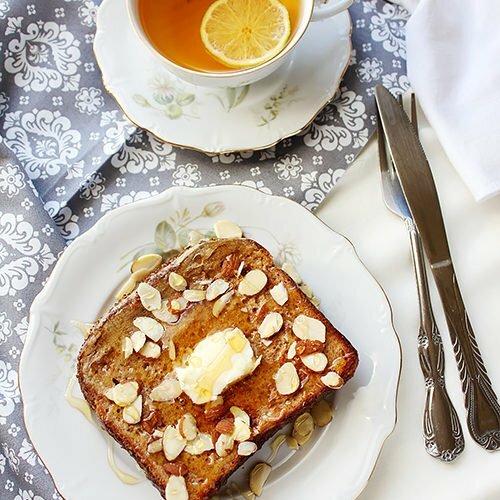 In my opinion, this French toast didn’t need the drizzling of honey, but if you like it sweet go ahead. This Cream Cheese Jam Stuffed French Toast had everything I like, the custard gave this French toast the right fluffy and light, yet still rich texture, the combination of nutmeg, cinnamon, and vanilla, gave it a great balanced flavor. In a <g data-gr-id="96" id="96" class="gr_ gr_96 gr-alert gr_gramm Punctuation only-ins replaceWithoutSep">bowl</g>, beat the eggs with brown sugar, then add the rest of the ingredients (except the bread) and mix well. Keep aside. In a different bowl, beat the filling until smooth. Keep aside. Dip the bread in the custard mixture and fry in a greased hot pan. When the bottom side is golden brown flip the bread. Spread half of the filling on the one bread while still on the pan. Place another slice on top and press gently. Do the same with the other two slices of bread. Make sure that both <g data-gr-id="86" id="86" class="gr_ gr_86 gr-alert gr_gramm Grammar multiReplace">side</g> of the bread is cooked. 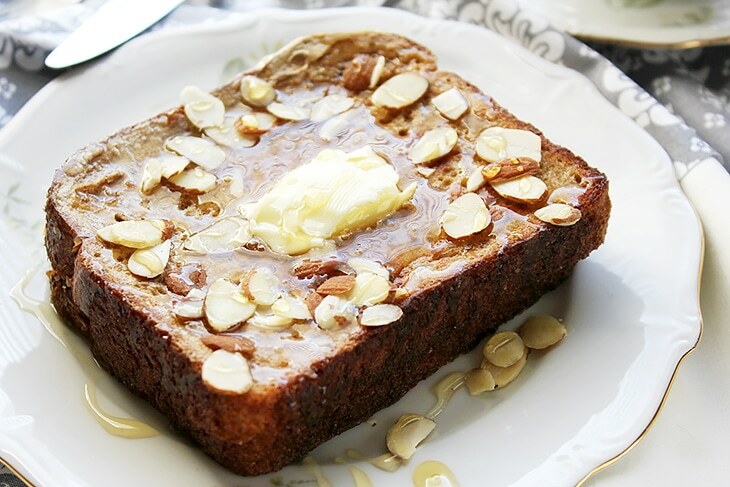 Sprinkle with roasted almonds, drizzle with honey and enjoy. A heavy breakfast..but just the right one for the holiday! OMG! That looks so amazingly delicious!!! 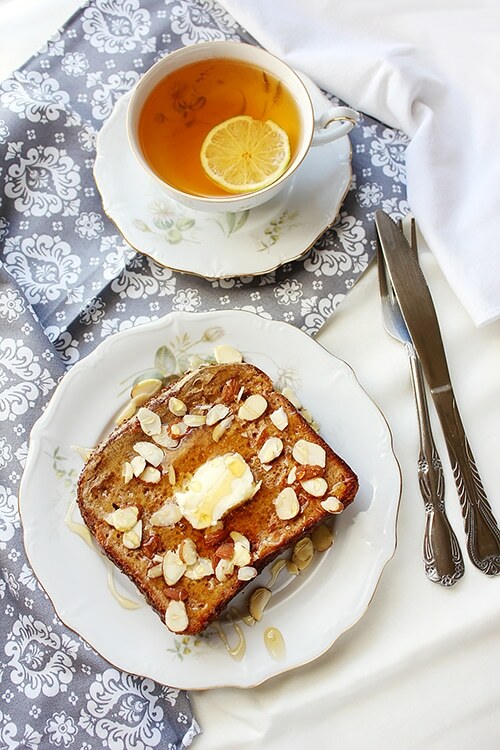 I loveeee french toast and make it often, but this stuffed one, I gotta try! I love the custard flavor in french toast, but adding cream cheese and jam as a filling resulted in a heavenly delight! Wow. 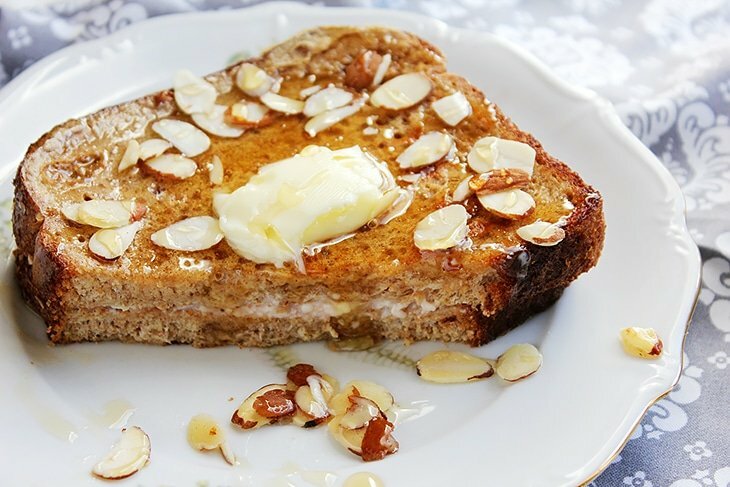 French toast and cream cheese! YUM! Perfect breakfast! Ohhhh I just got up and this is the first thing I look at. Not a good idea. Lol. Making me hungry. I’ve never thought of using cream cheese like in stuffed in fresh toast. Great idea. What a gorgeous breakfast! French toast and cream cheese? Yes please! What a gorgeous recipe! I am LOVING that cream cheese filling! 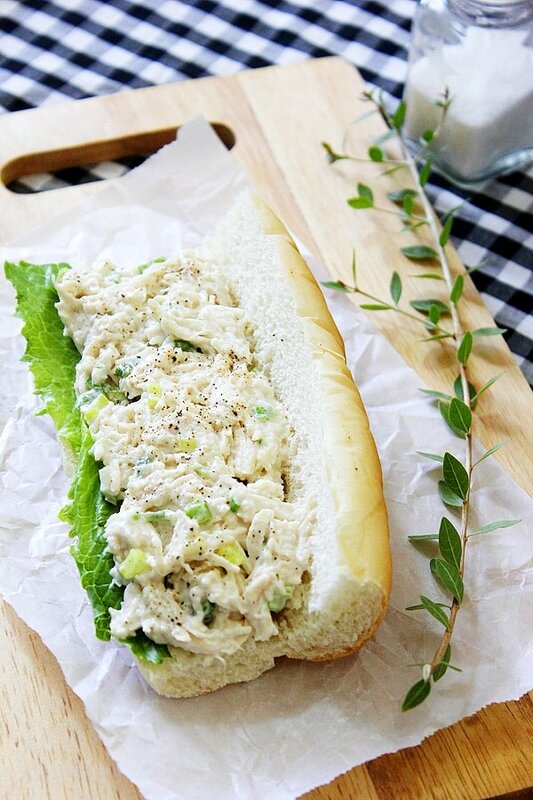 There are so many great flavor combos too you can create by changing up the cream cheese! Wow, this sounds so amazing! 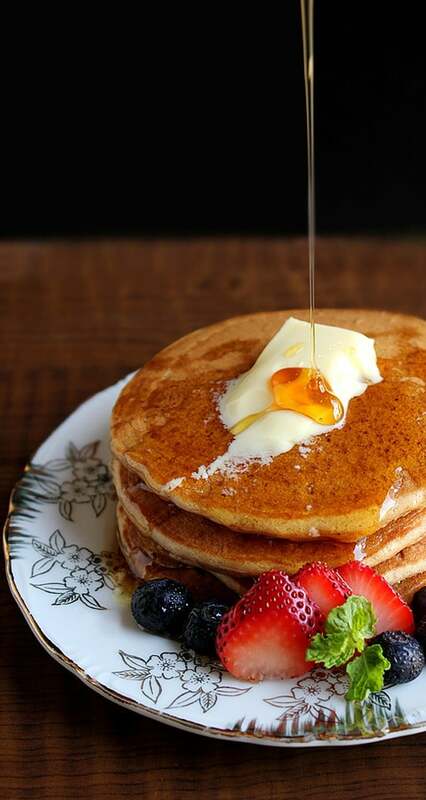 Breakfast foods are my favorite and I love when I find recipes like this that are a twist on a classic! 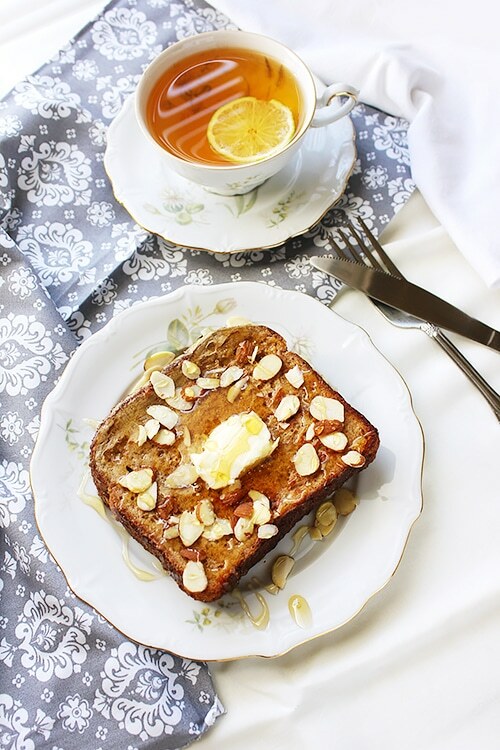 Stuffed french toast is such a great idea…I’ll have to show this to my family to make me for Mother’s day!